The Alberta World Cup Cross Country Ski Society is pleased to announce that the Government of Alberta is providing financial support for the Cross Country Ski Masters World Cup 2021. The Masters World Cup 2021 will be held in Canmore on February 27 – March 5, 2021 at the world-class Canmore Nordic Centre Provincial Park. Organizers plan to attract over 1,000 masters cross country skiers from around the world to this outstanding event. 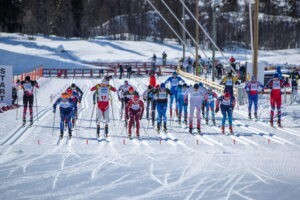 The Masters World Cup is held annually with the 2019 edition taking place in Beitostolen, Norway and the 2020 event slated for Cogne, Italy. Canmore last held the Cross Country Ski Masters World Cup in 1995 and Canmore is one of 3 worldwide towns to have the honour of hosting this prestigious event twice. The economic impact of the Cross Country Ski Masters World Cup 2021 is expected to be significant. With over 1,000 national and international skiers coming to Canmore for a 7-10 day period, the local economy will benefit greatly. The provincial support recognizes that economic impact, especially since it comes at a time of year when tourism levels are usually lower.